Rail TRAM system consists of a rail, a slider unit and a restraint belt. It is designed specifically for insulated road tankers and permits its operators to safely access and work on the top of the tank. Rail TRAM provides the user with an ideal system of mobility , stability and restraint that is simple and quick to install. As well as preventing falls on the platform, Rail TRAM provides protection and assistance in making the transition between the ladder and the platform. Rail TRAM is the only system in the world that protects the user while transferring from the ladder to the top of the tank. When connected to Rail TRAM, you can not fall. How is Rail TRAM Used? The worker puts on a lightweight restraint belt and ascends the ladder to a position where they can attach to the anchor point on the Rail TRAM slider unit. Then, in a single operation, the rail is gripped, the levers activated and the rail lifted into the upright position. The spring-assisted rail aids the operator throughout this process and the anchored belt prevents them from falling. When the Rail TRAM unit is raised it locks into position and the slider unit allows uninhibited access along the platform, without the entanglement risk associated with typical lifeline systems. Rail TRAM is suitable for spanning platforms of up to 30′ (9m). The system has an approximate weight of 220lb (99kg). Field-tested and proven design for maximum safety performance and mobility on wind turbines. Single day installation utilizing bonded, welded or clamped connections to limit down time. 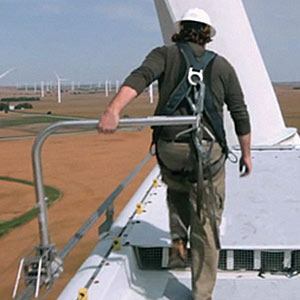 Low profile positioning to facilitate safe transfer from ladder to top of turbine. All weather durability and installation in extreme climates around the globe. Fire TRAM is built on the same technology proven in the field since 2004. Around the world, major organizations rely on Standfast products to protect employees working at height or in dangerous conditions from the consequences of a fall. For many years, we’ve worked with organizations in various industries to analyze their unique fall hazards and provide innovative, cost-effective solutions. 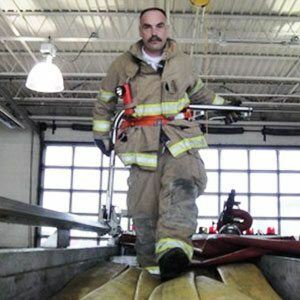 Firefighter: When using Fire TRAM, a height safety system, the risk of falling from an engine is eliminated, and when outfitted with the hose tool, time and manpower needed to bed hose is reduced. Fire Chief: Reduce the risk of injury and lost manpower by installing Fire TRAM. Risk Manager: Decrease workers comp claims and manpower issues. Decrease insurance rates with Fire TRAM.